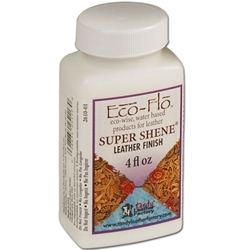 Eco-Flo Super Shene is a water based, low V.O.C., durable, water repellent, flexible, acrylic based high gloss top finish for natural veg-tanned tooling leather. Great for use over any Eco-Flo dye or stain product. May be used to resist or block the effects of acrylic stains or antiques for highlighting areas. Shake well before each use. Leather should be clean and dry. Apply a light even coat of Super Shene with a slightly damp sponge. Work in a circular motion, making sure finish gets into all cuts and impressions. Allow first coat to dry completely, and then apply a second light coat. After second coat has dried, buff to a high gloss with a clean soft cloth or piece of sheep wool. Clean applicators immediately after use with soap and water.